Everything bagels have plenty of things going for them -- sweet dough, salty toppings, and tangy cream cheese -- but where's the umami? That's where the hot dog comes in. I have to admit, I enjoyed these handheld bagel dogs even more than I thought I would. You will, too. Preheat oven to 400℉. Line a baking sheet with greased parchment paper. Combine poppy seeds, sesame seeds, caraway seeds, garlic, onion, and sea salt in a small bowl; set aside. Slice cream cheese lengthwise into 8 sticks; set aside. Cut dough into 8 equal pieces and roll each piece out into 9x4-inch rectangles. 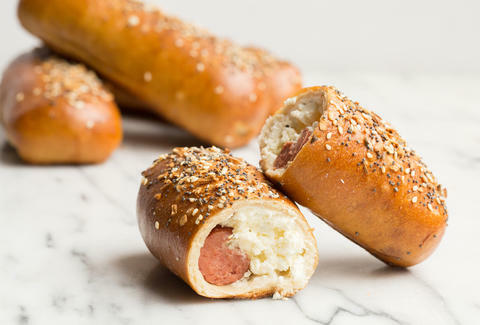 Lay a cream cheese stick and a hot dog lengthwise down the middle of each rectangle. Tuck the short ends over the filling then fold the long sides over to fully encase the dogs. Crimp the seams shut. 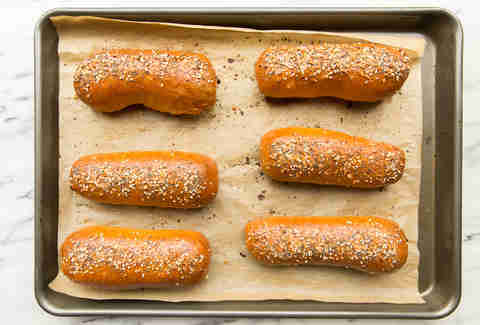 Place bagels on the prepared baking sheet, cover with a damp towel, and let them rest for 10 minutes. Meanwhile, bring a large pot of water to a boil over high heat, then reduce heat to medium-low and let it simmer. Once bagel dogs are rested, add baking soda and malt syrup to the simmering water. Boil 2 bagels at a time, for 1 minute on each side (they’ll look wrinkly). Remove them with a slotted spoon and return to the baking sheet, seam-side down. Repeat with the rest. Brush the tops with egg wash and sprinkle with everything seasoning. Poke a few holes in the bagels with a toothpick to release steam. Bake until golden brown, 20-25 minutes. 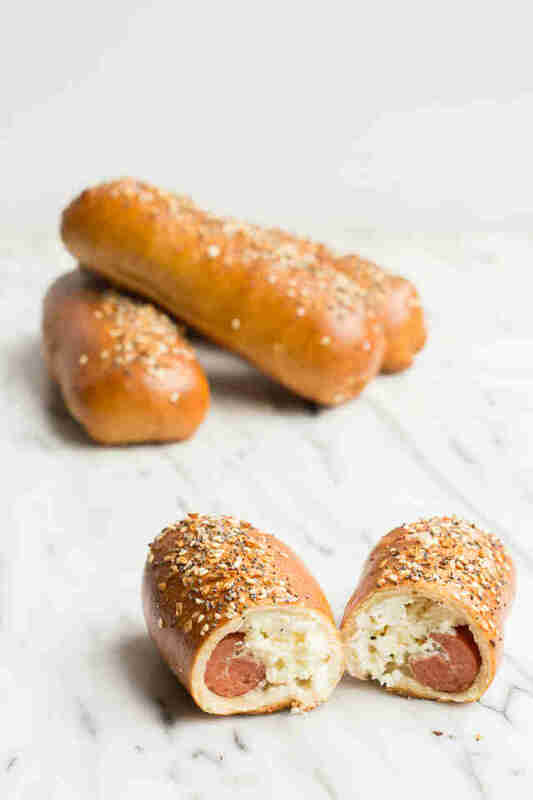 Let bagel dogs cool on the baking sheet for at least 15 minutes before serving.